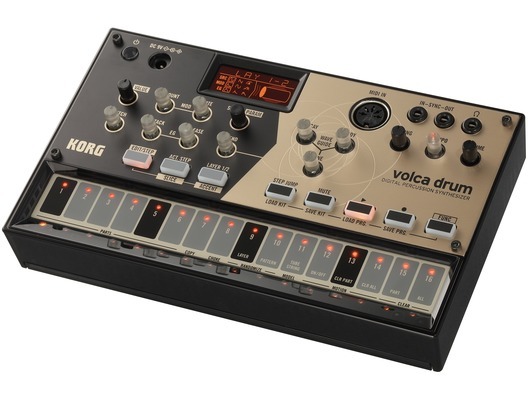 The Korg Volca Drum digital percussion synthesiser is the latest in the Korg Volca series. The Volca Drum uses DSP-powered analogue modelling to generate realistic-sounding bass, snare and cymbals but also lets you create and play with a wide variety of percussion sounds, while the newly-developed DSP engine and waveguide resonator bring you a whole host of ways to enrich them. The Korg Volca Drum really is the next step in digital music-making. The volca series is all about unique sound. Whether it's analog, PCM, or FM, the volca series puts unique sounds into an accessible platform. And now, the series is joined by a new rhythm machine that brings yet another sonic character. 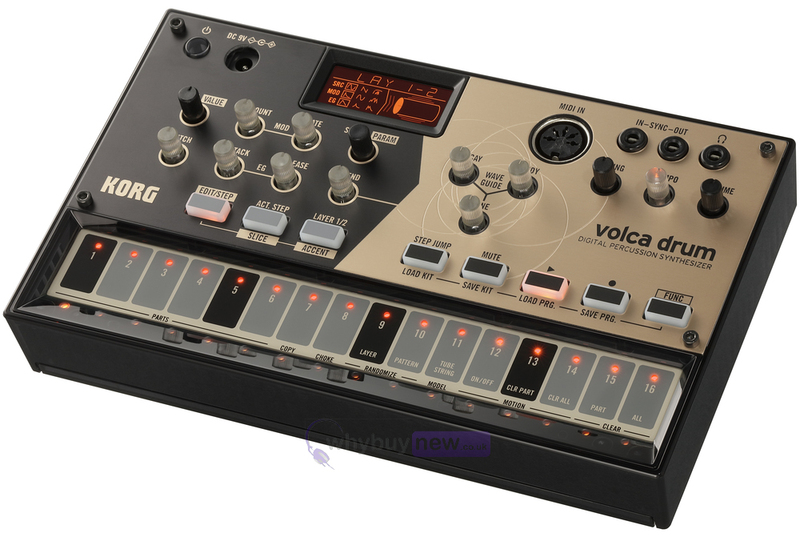 It's the volca drum digital percussion synthesiser. 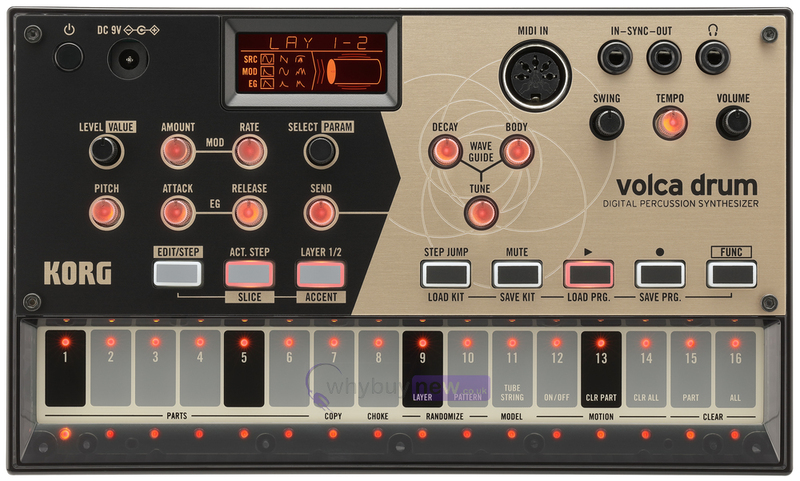 The term "digital" typically brings to mind sounds that are based on PCM-sampled bass drum, snare drum, or cymbal, but the volca drum creates its drum sounds by DSP-powered analog modelling. Oscillator waveforms such as sine wave, sawtooth wave, and noise are provided. By applying various changes to these waveforms, you can create a wide variety of percussion sounds that range from realistic to idiosyncratic, and are not limited only to drums. Each part consists of two layers. 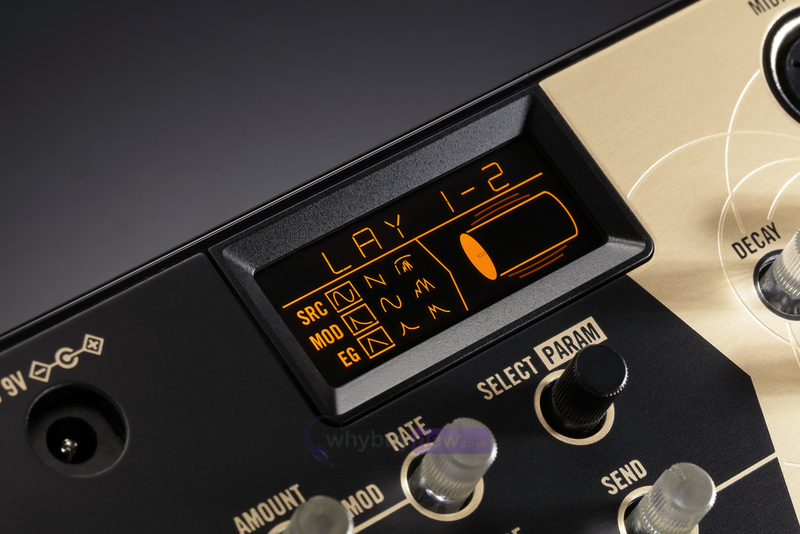 For each layer, users choose one of five types of oscillator waveform including sine wave, sawtooth wave, and HPF noise, and also choose from three types of pitch modulator and amp EG, each optimised for drum sounds. Layer parameters can be edited either individually or simultaneously, and users can also use the two layers to produce the same sound for additional thickness. The effect section features a waveguide resonator that's based on physical modeling, and which adds sympathetic resonances to the sound. You can choose from two types of waveguide: "tube" which adds the resonance of a cylindrical object such as a drum body or a long pipe, or "strings" which adds the metallic resonance of a string. The three knobs located in the center of the panel let you specify the DECAY (amount of attenuation), BODY (sonic character), and TUNE (pitch). Setting TUNE to a lower value will produce a delay-like behaviour. 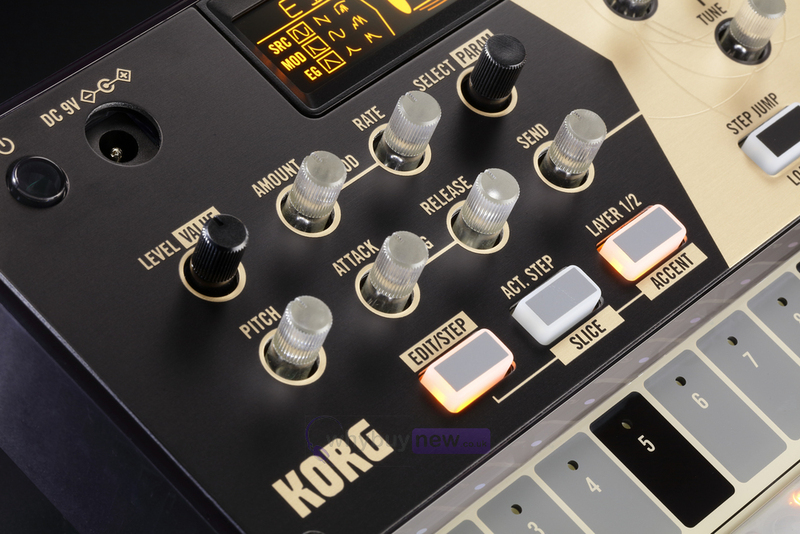 You can take advantage of these knobs not only for sound design but also in your live performances. In addition to simply playing a drum pattern, you can use the motion sequence function to memorise knob operations during realtime recording and reproduce them during playback; a total of 69 different parameters can be memorised. This is useful not only when you're creating your patterns, but can also contribute to live performances that overflow with originality. Up to 16 sequence programs (16-step sequencer patterns, stored motion sequences, kit number) can be saved in internal memory. An accent function that can be specified in 16 levels. The aluminium panel is created using an etching process that emanates a sense of quality, using delicate relief to express the text and fine lines rather than using printing. In a first for the volca series, a custom LCD is used. 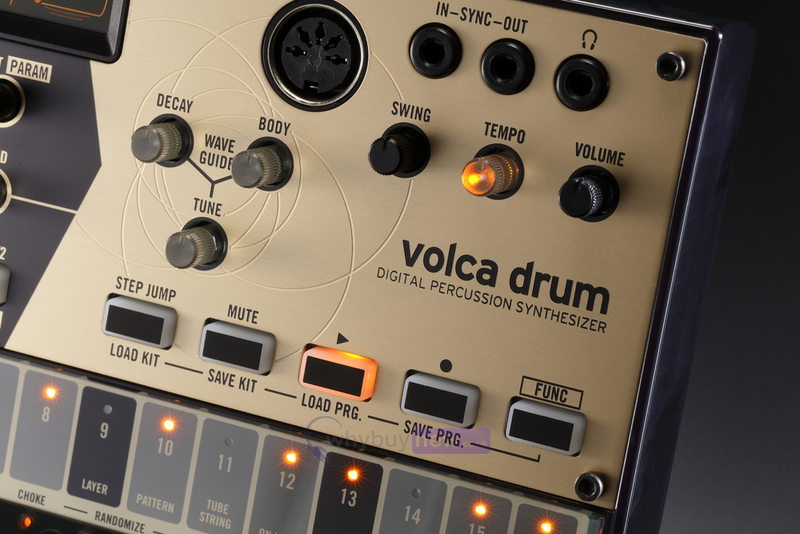 The high-brightness display provides excellent visibility, portraying complex settings graphically for comprehension at a glance, and ensuring that volca drum is easy to use with a quick learning curve. Kits: 16 (Settings for 6 parts + Settings for waveguide resonator) Kit No.1 No.10 are factory preset. Program: 16 (Sequence pattern, Motion sequence, Kit No.) Program No.1 No. 10 are factory preset.